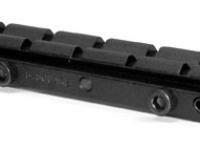 B-Square 17021 11mm-to-Weaver Adapter, Adjustable. . Things I liked: This fixed my TX200 MkIII barrel droop issues. 2 screws on each side clamp the weaver rail to the angle you pick. The rail pivots on a pin in the foremost set of holes. A stop screw allows you to raise weaver rail and a set screw locks same in place. Works great! Widely adjustable and locks on tight! Highly recommended, would definitely buy again (if needed). Things I would have changed: Price seems a little high but well worth it to fix my gun's issue. Instruction sheet is WAY too brief. Granted this is a fairly simple mount but some additional guidance would be helpful. Slots in Weaver rail seemed a little narrow and a little too squared off at the top. When used with 'Leapers Space Age 1" Rings, Low, Weaver Mount', tight fit and a little finish marring on the interior of the rail and mounts results. Nothing visible but it didn't go together nicely without applying excessive torque. Other Weaver mounts with rounded cross bars worked fine with no marring of the rail. What others should know: Here's what I did to install this on my TX200 MkIII (omitting the head scratching and fiddling around parts): Step 1 - Remove set screw on front end of Weaver rail, remove round front 'support' plug. This just gets in the way on this gun. Step 2 - Mount rail loosely on gun, raise rail to approximate angle 'your scope/gun will work with' using elevation adjustment/stop screw and install set screw in rear end of rail to keep this adjustment from changing. Step 3 - Install scope and try to sight in. I found my first guess was a bit too much angle so I ended up shooting high and running out of down adjustment. I then reduced the angle of the rail too much and was shooting low again. The 3rd time was the charm and I hit 'close enough' to the middle of my scope's adjustment range to sight in and leave room for adjustment either way. I suppose I could've measured and done some calculations to get closer the first time... but what fun would that be? Great product! Things I would have changed: Use thicker screws or harder metal so the screws don't strip out. What others should know: Don't waste your money on this the clamp, it did not properly fit the dovetail on my B28 (RWS 350 Clone) or the screws striped out before it could make a good tight fit. Things I liked: Great item, superb workmanship. Installed on Gamo CFX. removed the aluminum piece, and replaced it with this peice. no more need for a extra scope stop. weaver rail is the way to go. Things I would have changed: wish it had a stop screw to control the rise. untill i tighthened quite firmly the scope kept jumping up and out of zero. I too, have a Gamo CFX .22 caliber, with gas ram. I bought this adapter in an attempt to convert to Weaver rings, and the rings held fast, but the adapter kept jumping skyward at each shot. No matter how hard I cranked down on the clamp screws, it continued doing that. Then, the front clamp screw stripped out. To PA's credit, they accepted it on return for a refund. How in the WORLD did you do it? If only this had not been made adjustable for elevation, it would have been the perfect adapter.